J. W. Lichtman and J.-A. Conchello, “Fluorescence microscopy,” Nat. Methods 2(12), 910–919 (2005). S. W. Hell and E. Rittweger, “Microscopy: Light from the dark,” Nature 461(7267), 1069–1070 (2009). A. G. Bell, “Upon the production of sound by radiant energy,” Am. J. Sci. 20, 305–324 (1880). Y. Wang, K. Maslov, C. Kim, S. Hu, and L. V. Wang, “Integrated Photoacoustic and Fluorescence Confocal Microscopy,” IEEE Trans. Biomed. Eng. 57(10), 2576–2578 (2010). S. Hu, K. Maslov, and L. V. Wang, “Second-generation optical-resolution photoacoustic microscopy with improved sensitivity and speed,” Opt. Lett. 36(7), 1134–1136 (2011). 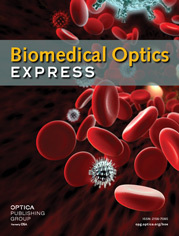 R. Ma, S. Söntges, S. Shoham, V. Ntziachristos, and D. Razansky, “Fast scanning coaxial optoacoustic microscopy,” Biomed. Opt. Express 3(7), 1724–1731 (2012). E. M. Strohm, E. S. L. Berndl, and M. C. Kolios, “High frequency label-free photoacoustic microscopy of single cells,” Photoacoustics 1(3-4), 49–53 (2013). P. Hajireza, J. Sorge, M. Brett, and R. Zemp, “In vivo optical resolution photoacoustic microscopy using glancing angle-deposited nanostructured Fabry-Perot etalons,” Opt. Lett. 40(7), 1350–1353 (2015). S. Yang, F. Ye, and D. Xing, “Intracellular label-free gold nanorods imaging with photoacoustic microscopy,” Opt. Express 20(9), 10370–10375 (2012). D. A. Nedosekin, E. I. Galanzha, E. Dervishi, A. S. Biris, and V. P. Zharov, “Super-Resolution Nonlinear Photothermal Microscopy,” Small 10(1), 135–142 (2014). A. Danielli, K. Maslov, A. Garcia-Uribe, A. M. Winkler, C. Li, L. Wang, Y. Chen, G. W. Dorn, and L. V. Wang, “Label-free photoacoustic nanoscopy,” J. Biomed. Opt. 19(8), 086006 (2014). C. Zhang, K. Maslov, J. Yao, and L. V. Wang, “In vivo photoacoustic microscopy with 7.6-µm axial resolution using a commercial 125-MHz ultrasonic transducer,” J. Biomed. Opt. 17(11), 116016 (2012). S. Telenkov, A. Mandelis, B. Lashkari, and M. Forcht, “Frequency-domain photothermoacoustics: Alternative imaging modality of biological tissues,” J. Appl. Phys. 105(10), 102029 (2009). S. Telenkov, R. Alwi, A. Mandelis, and A. Worthington, “Frequency-domain photoacoustic phased array probe for biomedical imaging applications,” Opt. Lett. 36(23), 4560–4562 (2011). S. Kellnberger, N. C. Deliolanis, D. Queirós, G. Sergiadis, and V. Ntziachristos, “In vivo frequency domain optoacoustic tomography,” Opt. Lett. 37(16), 3423–3425 (2012). P. Mohajerani, S. Kellnberger, and V. Ntziachristos, “Frequency domain optoacoustic tomography using amplitude and phase,” Photoacoustics 2(3), 111–118 (2014). K. Maslov and L. V. Wang, “Photoacoustic imaging of biological tissue with intensity-modulated continuous-wave laser,” J. Biomed. Opt. 13(2), 024006 (2008). A. Petschke and P. J. La Rivière, “Comparison of intensity-modulated continuous-wave lasers with a chirped modulation frequency to pulsed lasers for photoacoustic imaging applications,” Biomed. Opt. Express 1(4), 1188–1195 (2010). L. D. Favro, P. K. Kuo, J. J. Pouch, and R. L. Thomas, “Photoacoustic microscopy of an integrated circuit,” Appl. Phys. Lett. 36(12), 953 (1980). A. Rosencwaig and G. Busse, “High-resolution photoacoustic thermal-wave microscopy,” Appl. Phys. Lett. 36(9), 725 (1980). P. Herman, B. P. Maliwal, H.-J. Lin, and J. R. Lakowicz, “Frequency-domain fluorescence microscopy with the LED as a light source,” J. Microsc. 203(2), 176–181 (2001). P. Harms, J. Sipior, N. Ram, G. M. Carter, and G. Rao, “Low cost phase-modulation measurements of nanosecond fluorescence lifetimes using a lock-in amplifier,” Rev. Sci. Instrum. 70(2), 1535 (1999). M. J. Booth and T. Wilson, “Low-cost, frequency-domain, fluorescence lifetime confocal microscopy,” J. Microsc. 214(1), 36–42 (2004). H. Urey, “Spot size, depth-of-focus, and diffraction ring intensity formulas for truncated Gaussian beams,” Appl. Opt. 43(3), 620–625 (2004). J. Eisinger, J. Flores, J. A. Tyson, and S. B. Shohet, “Fluorescent cytoplasm and Heinz bodies of hemoglobin Köln erythrocytes: evidence for intracellular heme catabolism,” Blood 65(4), 886–893 (1985). M. Asghari-Khiavi, B. R. Wood, A. Mechler, K. R. Bambery, D. W. Buckingham, B. M. Cooke, and D. McNaughton, “Correlation of atomic force microscopy and Raman micro-spectroscopy to study the effects of ex vivo treatment procedures on human red blood cells,” Analyst (Lond.) 135(3), 525–530 (2010). M. Xu and L. V. Wang, “Photoacoustic imaging in biomedicine,” Rev. Sci. Instrum. 77(4), 041101 (2006). I. G. Calasso, W. Craig, and G. J. Diebold, “Photoacoustic point source,” Phys. Rev. Lett. 86(16), 3550–3553 (2001). R. L. Shelton and B. E. Applegate, “Ultrahigh resolution photoacoustic microscopy via transient absorption,” Biomed. Opt. Express 1(2), 676–686 (2010). American National Standard for the Safe Use of Lasers, ANSI Z136.1–2007, Laser Institute of America, Orlando, FL (2007). J. J. Irwin and J. T. Kirchner, “Anemia in Children,” Am. Fam. Physician 64(8), 1379–1386 (2001). J. G. Morris, W. S. Cripe, H. L. Chapman, D. F. Walker, J. B. Armstrong, J. D. Alexander, R. Miranda, A. Sanchez, B. Sanchez, J. R. Blair-West, and et, “Selenium deficiency in cattle associated with Heinz bodies and anemia,” Science 223(4635), 491–493 (1984). L. V. Wang, “Multiscale photoacoustic microscopy and computed tomography,” Nat. Photonics 3(9), 503–509 (2009). A. Hochreiner, J. Bauer-Marschallinger, P. Burgholzer, B. Jakoby, and T. Berer, “Non-contact photoacoustic imaging using a fiber based interferometer with optical amplification,” Biomed. Opt. Express 4(11), 2322–2331 (2013). C. P. Favazza, O. Jassim, L. A. Cornelius, and L. V. Wang, “In vivo photoacoustic microscopy of human cutaneous microvasculature and a nevus,” J. Biomed. Opt. 16(1), 016015 (2011). L. Gao, L. Wang, C. Li, A. Garcia-Uribe, and L. V. Wang, “Photothermal bleaching in time-lapse photoacoustic microscopy,” J. Biophotonics 6(6-7), 543–548 (2013). K. I. Willig, B. Harke, R. Medda, and S. W. Hell, “STED microscopy with continuous wave beams,” Nat. Methods 4(11), 915–918 (2007). Fig. 1 Schematic of the setup. A function generator (f-gen) is used to modulate a cw diode laser (laser 405 nm). Laser light is focused onto the sample by an objective lens (20 × , NA = 0.5). Photoacoustic and luminescence signals are measured via a hydrophone and an avalanche photo-diode (APD), respectively. The lock-in amplifiers (LIA) are set to the modulation frequency. The 3D scanning stage is symbolized by the xyz coordinate system. Fig. 2 (a) fOR-PAM image of a chromium line target with 120 lines/mm. (b) Profile of the photoacoustic image along the red line. Fig. 3 fOR-PAM image (a) and simultaneously obtained luminescence image (b) of human red blood cells. (c) Overlay of the photoacoustic and the luminescence image. (d) Bright-field image of the same region. (2) K=1.654− 0.105 a w + 0.28 a 2 w 2 . (3) p(t)= σ β 1 4π c p r ⋅ E θ 2 ⋅ d d τ ^ f( τ ^ ). (5a) p G (t)∝ 2t E G τ G 3 π exp( − t 2 τ G 2 ). (5b) p G,max ∝ 2 e π E G τ G 2 . (7a) p S (t)∝2π f S 2 E S cos( 2π f S t )=2π I 0 f S cos( 2π f S t ). (8) p G,max p S,max = 1 2π e ⋅ 1 π ⋅ E G I 0 ⋅ 1 τ G 2 ⋅ f S ≈ 1 4π ⋅ E G I 0 ⋅ 1 τ G 2 ⋅ f S .
(10) B LIA = 1 2π τ LIA . (11) SNR G SNR S = p G,max ⋅ξ NEP ⋅ NEP p S,max ⋅χ ≈ 1 4π ⋅ E G I 0 ⋅ 1 τ G 2 ⋅ f S ⋅ ξ χ . (12) I 0,max =1.1⋅ 10 4 × (τ/sec) −0.75 W/m 2 .